AQHA Racing Champion jockey Cody Jensen boots First Prize Dive to victory in the $318,217 Black Gold Futurity Championship(RG3) at Will Rogers Downs on Saturday. CLAREMORE, OK�NOVEMBER 8, 2014�Under champion jockey Cody Jensen, First Prize Dive prevailed over Tellem Scout by a neck in Saturday's $318,217 Black Gold Futurity Championship(RG3) at Will Rogers Downs. A Black Zipper led early but finished a neck back in the show position. First Prize Dive completed the 440 yards in quick :21.653 seconds, earning a 103 speed index with a 10 mph crosswind. The $127,287 winner's purse pushed his career total over $150,000. Brandon Reed saddled The royally bred son of multiple stakes sire IVORY JAMES to his fourth win in 10 career starts. The Black Gold Futurity Championship(RG3) was the bay gelding's first stakes win, however he was finalist in the $171,650 Speedhorse Gold & Silver Futurity(RG2) earlier this year at Fair Meadows. Looking For Gold Racing owns the Weetona Stanley Oklahoma-bred from the Mr Jess Perry mare First Prize Pearl. She is a daughter of former Broodmare of the Year First Prize Dash, by Dash For Cash. First Prize Dive entered the race as the fastest qualifier from three trials contested on October 25. Tellem Scout earned $54,097 for owners Dan and Louise Jones for his second place effort. Ty Blackwell conditions the Stone Chases Stables, LLC Oklahoma-bred Teller Cartel filly out of A Lil Known Fact, by Special Task. James Flores had the riding assignment. 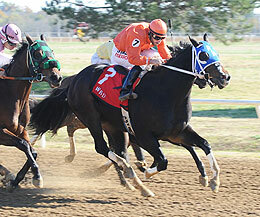 The brown filly's 2-year-old record stands at (8) 1-2-2 and she has earned just under $70,000. A Black Zipper, who fourth in the Speedhorse Gold & Silver Futurity last summer, earned his black-type with the third place Black Gold Futurity Championship finish for owner Julio Contreras. Joe Neff saddled the Count Corona gelding out of Stayin On Task, by Special Task. Ridden by Cody Smith, the John and Sylvia Crian Arkansas-bred picked up $35,004 for the effort to bring his earnings total to $100,509. Bp Run Cartel, A Royal Fling, Famous Candy Cat, Pyc Prize Time, Clouds A Dancin, Cartel Rosie and Tld Moonshine Wagon completed the field.